Looks like someone has been shuffling Apple's release calendar. 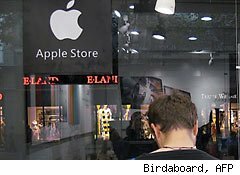 According to an AllThingsD.com report, consumers planning to snap up an iPhone 5 in late September may have to cool their heels for a few extra weeks, until the new phone hits shelves in October. The potential delay has thrown dyed-in-the-wool Apple (AAPL) fans for a loop. But a larger question looms: Has the season for harvesting iPhones perpetually shifted? More importantly, what might such a change reveal about Apple's future plans? Since it debuted the product in 2007, Apple has stuck with a tried-and-true iPhone product release cycle. New versions of the iPhone have hit U.S. stores in June, with the exception of 2008, when the date was in mid-July. Some investors may worry about the effect that a few weeks' delay will have on the company's fourth quarter, which ends in September. That's hardly worth losing sleep over. At most, it will push pent-up demand for the iPhone 5 from one quarter to the next, says Ashok Kumar, an analyst with Rodman & Renshaw: "Consumers aren't going to walk away from buying an iPhone 5 if it's delayed from the last week of September to October." Even with its product cycle – and the potential for a future iPhone to be pushed out of the next quarter -- Apple noted in its recent blowout third quarter that it expects to generate $25 billion in revenue when it reports its fourth-quarter results. If that comes true, it would represent a 25% year-over-year increase. Apple is notorious for lowballing estimates, so you can probably expect that number to be even higher. Even if it's planning on a delayed iPhone -- a product which accounted for about 40% of company sales last fiscal year -- Apple seems quite confident that consumers will continue to snap up iPhone 4s in the coming months. Investors should take greater interest in what the September (or October) launch might say about Apple's underlying strategy. "It shows that there is more than a year's life cycle to this product," notes Andy Hargreaves, an analyst with Pacific Crest Securities. "A typical (smartphone or computer maker) releases a lot of products every year, so their product cycle is shorter. Apple has shown it can have a longer product cycle." That, in turn, could help lower Apple's expenses by reducing the need to retool manufacturing lines, and increase the return on the company's research and development investment. Apple, however, may take this opportunity of breaking with its traditional iPhone product cycle to open Pandora's box, by launching a couple of iPhone versions in a given year. That may not be such a bad idea, given that smartphones based on Google's (GOOG) Android operating system and other competitors are tearing into Apple's market share. During the fourth quarter, Android-based phones grabbed top billing among smartphone operating systems, surpassing the former leader, Nokia's (NOK) Symbian. Even Bigger Releases in Apple's Future? Gleacher & Co. analyst Brian Marshall, for one, believes Apple may try a double iPhone release. He thinks this fall's expected iPhone 5 launch will only serve as a minor upgrade, presaging a wholesale change this coming April or May. That's when Marshall suspects Apple will release a totally revamped iPhone to run on Long Term Evolution (LTE), or 4G, networks. And while older 3GS iPhones are relatively cheap, selling for a mere $49 with a two-year AT&T calling plan, Marshall suspects Apple could increase its efforts to reach price-conscious consumers and the low end of the market in the second half of the year. Apple could introduce a prepaid version of its iPhone, notes Marshall. Again, that would help Apple compete against Android-based phones, which are offered on a wide variety of price-point handsets. Prepaid iPhones could also aid Apple in emerging markets, where citizens tend to favor such calling plans. But more importantly, by going for a one-two punch in iPhone rollouts in a given year, Marshall says: "[Apple's] product cycle would no longer be annual and by staggering it, it would have the effect of smoothing out their revenues." Either way, Apple's been raking it in big since it debuted its iPhone, and expectations remain that it'll continue that bountiful harvest. Motley Fool contributor Dawn Kawamoto does not hold shares in any of the companies listed. She does, however, own a smartphone, and debates the merits of an iPhone or no-iPhone with other family members who lust after the device. The Fool owns shares of Apple and Google, and its newsletters have recommended buying shares of both companies, and creating a bull call spread in Apple.